Description:There are several temples in the vicinity of Pazhayaarai - Patteeswaram, Darasuram, Satthi Mutham. 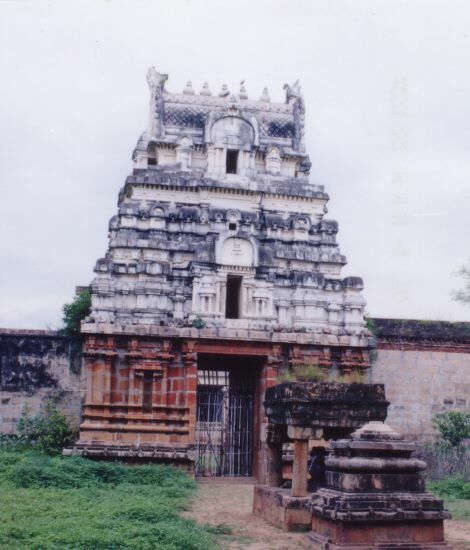 The Vadatali temple houses Dharmapureeswarar & Vimalanayaki, while Pazhayarai houses the grand Somanathar temple now in ruins. Vadatali is also known as Vallalaar Kovil. Patteeswaram is considered to be the 24th in the series of Tevara Stalams in the Chola kingdom located south of the river Kaveri. The Temple: This is a Maadakkoyil built at an elevation by Ko Chenkann Cholan. Inscriptions and ancient structures abound in its vicinity. Pazhaiyarai was once a capital of the Pallavas and then one of the ancient capitals of the Cholas. Even after setting up a capital at Thanjavur, the Royal Cholas continued to live here. It is believed that Raja Raja Chola I was raised here. It went into oblivion during the early Chola period, but came back into prominence in the later Chola period (12th, 13th centuries), when the area between the Kaveri and the Tirumalairajan channel became the cradle of Tamil culture, temple building activity and literature. Very closeby are the temples of Darasuram, Tribhuvanam, Sattimuttam, Patteeswaram and Kumbhakonam. This town is surrounded by lush green fields and by the Mudikondan and Arisilaaru rivers. The entire area abounds in archeological remains of ancient buildings. The Keezhttali and Metrali are the other Shiva temples in Pazhayaarai. Legend has it that Chandra worshipped at Pazhayarai. Sundarar has sung praises of the Metrali temple. Sculptural value: There are several carvings of great beauty in this temple (now in a poor state), dating back to the period of the later Cholas. Mention must be made of those depicting fights between a lion and a warrior, the slaying of Hiranyakasipu, and the lifting of the Kailasa Parvatam by Ravanan. The Somanathar temple resembles the Vikrama Choleeswaram temple at Tirukkachi, the Airavateswarar temple at Darasuram, and Tribhuvaneswaram at Tribhuvanam. It is dated as a monument initiated by Vikrama Cholan and completed by Rajaraja II (1130 - 1160. Its outer wall has the remains of a 7 tiered gopuram along the likes of those at Chidambaram and Tiruvarur. The gopura vasal, in two tiers, resembles that at Tiruvarur. The dance panels depicting the Bharatanatya Karanas, on the wall faces of the entrance, bear the same architectural and iconic features as are noticed at Chidambaram, Darasuram and Tribhuvanam. Its inner prakaram encloses an area of about 50000 sq ft, and it has a tiruchutrumaaligai. Interestingly, Ardhanareeswarar occupies the rear niche of the sanctum, as opposed to Lingodbhavar. The ratha (chariot) mandapam in front of the Somanathar temple is chariot shaped and the life like images of horses and elephants pulling these are of great beauty.The vast Somanathar temple is thus a veritable art gallery with several interesting features added over a period of time. Templenet acknowledges Mr. C. Vedanarayanan for his contribution of the image of the Pazhaiyaarai temple tower above.